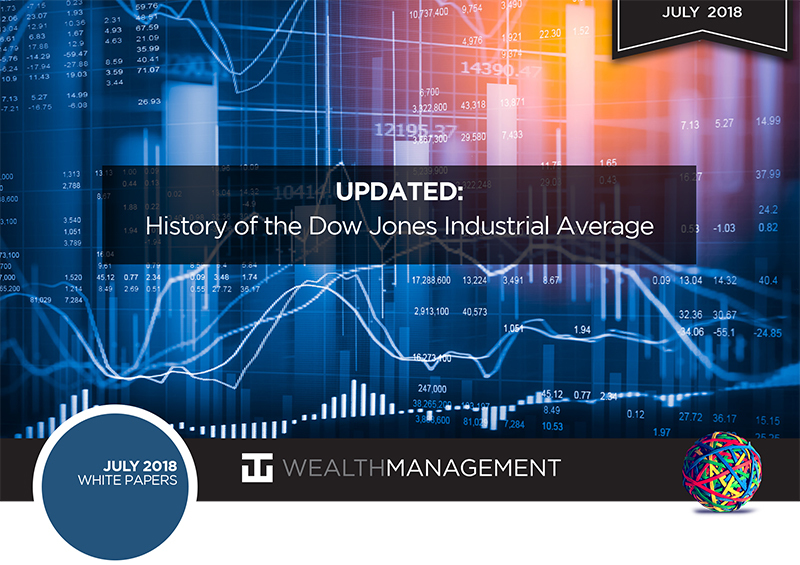 Given the recent events of June 26, 2018 - particularly General Electric's (GE) removal from the Dow to be replaced by Walgreens Boots Alliance (WBA) - we saw this as an excellent time to revisit the history of the Dow Jones Industrial Average (DJIA). This isn't just about the DJIA, GE, or Walgreen's. It's a lesson about how things change, and how, as an investor or investment manager, you should not expect anything that dominates our lives today to be around tomorrow. After more than a century, GE, has been removed from the DJIA, despite being in the index continuously since November 7, 1907. This adds to GE's highly publicized troubles: a critical cash crisis from years of poor deals; a replacement of its CEO; thousands of layoffs; attempts to sell some of its long-term business divisions, including railroads and light bulbs, to reduce its massive debt; and the halving of its stock dividend. Looking back over the years we realize companies must evolve or natural selection will take hold. Let's look back at our white paper, published in July 2016 - "A Brief History of the Dow Jones Industrial Average." More than 120 years after its inception, there's hardly a news story about the American stock market that doesn't mention the DJIA - its iconic presence in American financial markets is undeniable. Yet, over the course of its existence, to what extent has the DJIA truly reflected the nature of the U.S. economy at large? We hear about the DJIA every day, but have you ever stopped and thought about its history? Did you know it is composed of just 30 stocks? Is it still relevant in today's markets? Is it still a good indicator to track major American industry? Is it a good benchmark for your portfolio? After all, notable companies like Amazon, Google, Facebook, and many others have no presence in the DJIA, and companies that had previously been so integral to American culture - Woolworth's, Bethlehem Steel, Sears, even AT&T - are now distant memories to DJIA watchers. Let's rewind a few decades and look at how the DJIA stood in August 1982. In the spring of 1896 Charles Dow created two separate Averages: the Industrials and the Railroads. Shortly thereafter, The Wall Street Journal (which Dow had founded in 1889) reported an independent Railroad Average, as well as an Average composed entirely of industrial and natural resource concerns. These Averages together became known as the Dow Jones Industrial Average (DJIA), which Dow co-launched with Edward Jones and Charles Bergstresser in reaction to an increasing demand for stock activity information spurred by the growing formation of huge corporations through mergers and their active pursuit of markets for their stock shares. Although both Averages first appeared on May 26, 1896, the Industrials were not regularly reported in the WSJ until October 7 of that year. Their starting point that day was a mere 40.94 - a long way from where the DJIA sits today. Early on, the Industrials were a dynamic Average, changing composition almost monthly. Because the DJIA was designed to represent America's current business environment, Dow included the country's leading industries - sugar, spirits, leather, cordage, tobacco, gas, lead, rubber, coal, iron, and electrical products - in his Average. It included big names such as American Cotton Oil, American Sugar, Distilling & Cattle Feeding, Laclede Gas, National Lead, and U.S. Rubber. This is a far cry from today's Index, which is dominated by retailing, oil, technology, pharmaceuticals, and entertainment companies, and includes such names as American Express, Walt Disney, Merck, Microsoft, and United Technologies (the grid below has the DJIA's most up-to-date holdings.) GE's removal and the addition of Walgreen's is the first shake-up to the prestigious Dow since March 2015, when Apple (AAPL) replaced AT&T. 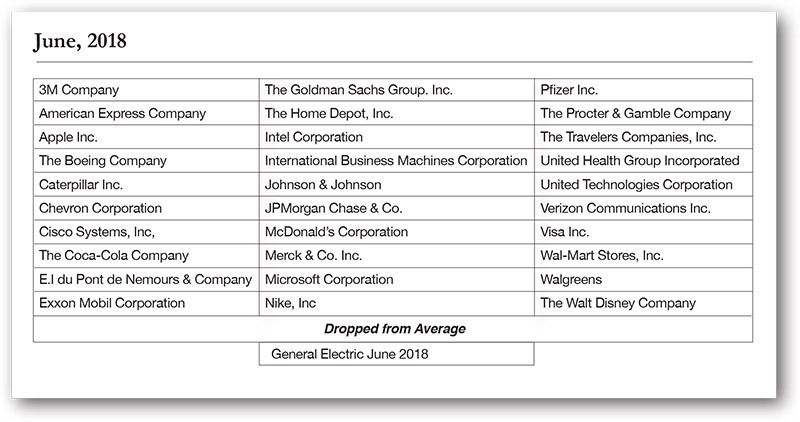 Currently, 30 U.S. blue-chip stocks are listed in the Dow Jones Industrial Average, 20 in the Dow Jones Transportation Average, and 15 in the Dow Jones Utilities Average. 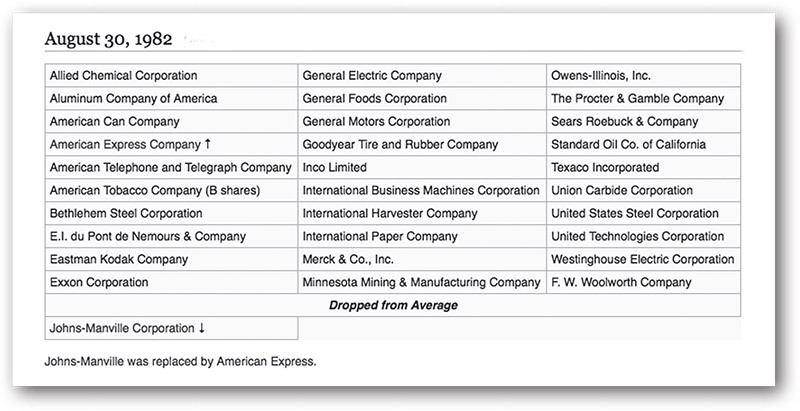 Until its recent removal, GE was the only company on the original list of Industrials that endured on the DJIA to the present day. In fact, since its founding, the DJIA has received a new component about every three years. The editors of the Dow Jones Indices oversee any shifts in the composition of the Averages and see that periodic adjustments are made, both to ensure the DJIA's continued reflection of the current business climate and to compensate for mergers and bankruptcies involving Dow stocks. This function has maintained Charles Dow's original commitment to ensure that the mix of companies on the Averages remains analogous to the broader market. When choosing a company to represent a specific industry in the Dow, the following criteria are considered: Is the company a leader? How long has it been around? Does it treat its shareholders well? What is its reputation in the industry? Dow companies must be leaders in a specific industry or sector. The DJIA has traditionally comprised corporate giants and massive companies whose shares have been publicly traded for decades. Although companies like Coca-Cola and McDonald's might appear outdated compared to the Amazons and Facebooks of the world, that Coke and McDonald's have been multi-billion-dollar companies for decades suggests an incredible staying power their juvenile competition has yet to demonstrate. Though the presence of decades-old industrial companies like Caterpillar on the Index may also make it appear antiquated, many investors forget that Caterpillar is a global company that has helped to develop and modernize the infrastructure of a growing world. The Dow's industry weighting underwent a major shift when tobacco king Philip Morris acquired Dow component General Foods in 1985. This immediately brought Philip Morris onto the DJIA, which doubled the index's tobacco company representation by adding a competitor of Dow component American Brands (formerly American Tobacco). Consequently, DJIA editors eliminated American Brands from its stock listings and listed McDonald's to give the restaurant industry more representation. Regarding bankruptcy, the John Manville Company is the only firm to fall off the DJIA for financial reasons - namely, the lawsuits it was facing over its patented asbestos-based products. Chrysler's financial deficit, eventually remunerated by a U.S. government bailout, may have ended its DJIA listing in the early 1980s, though it technically never went bust. The only other high-profile bankruptcy was Texaco in 1987, after its attempted acquisition of Getty Oil resulted in a major fine due to a breach of contract, but Texaco was not removed from the DJIA until 1997. 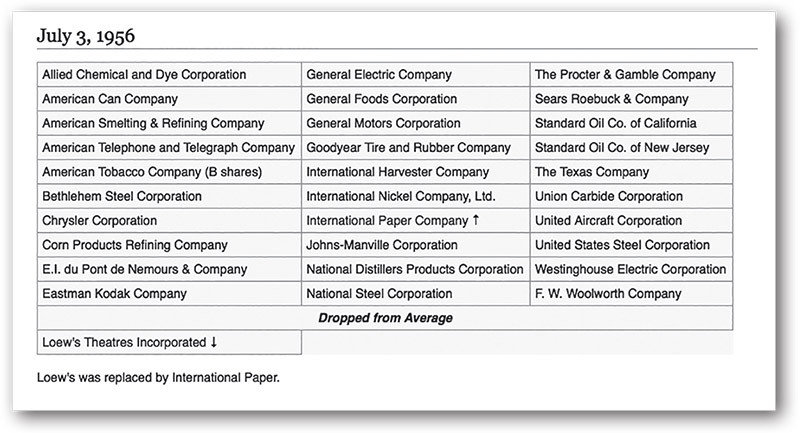 Even Exxon's Valdez disaster and Union Carbide's Bopahl tragedy were not enough to get them kicked off the Index. Sometimes, our white papers are detailed and cumbersome with information on U.S. and world geopolitical and economic driver theories. At other times, like today, we simply reminisce. The Dow Jones Industrial Average has an interesting history. It's surprising, however, that many people talk only about the DJIA, but are unaware of it's only narrow representation of corporate America. This white paper was meant to be just as nostalgic as informative. Losing GE from the Dow was like losing an old friend you hadn't spoken to in years. Maybe you had lost track of GE, but in the back of your mind, you still knew it was there. But now it's gone. Most industry analysts are unsure what will come of GE. They could have been a leader in American technology, driverless car technology, Ring video doorbell and security systems (instead, now Amazon is acquiring this component), smart locks - heck, smart anything. But they were not. Today, GE sells off what's valuable and fights for survival in a landscape where technology and innovation rules supreme. Children today will never flip through the Sears catalog, sit at a Woolworth's counter, or wait a week for pictures to be developed from Kodak film onto Kodak paper. That's a lost generation. Thankfully, many in our firm remember those days; they show us, as financial advisors, that nothing lasts forever and innovation will always change and shape our country. It's crucial to look far down the line for companies that will appear on our radar screens as well as those that will fade away. This is one of the reasons why we produced last month's white paper on technology, robotics, and artificial intelligence. We like to provoke thought and elicit dialogue. Is the DJIA still a great indicator for measuring your investment success? Probably not. It doesn't include many of today's major technology players that drive the economy and change the landscape in which we live. Plus, it's a narrow representation being only 30 stocks - hardly a broad representation of the American landscape. At WT Wealth Management, we use the S&P 500 as our basic measurement benchmark. The S&P 500 includes America's largest 500 companies' from industrials to utilities to healthcare to consumer discretionary and from financials to materials. The S&P 500 represents the entire universe of the American economy much more fairly and broadly than the DJIA does, in part because the S&P 500 includes many of the major drivers of today's economy: Wells Fargo, Amazon, Facebook, Google, FedEx, UPS, and MasterCard where the DJIA does not. We'll leave you with a look at 1956 (oh, has the world changed!) and the DJIA. Befumo, Randy, and Alex Schay. "History of Dow Jones." Chart Dreams, 2018. "Dow Jones History." Internet Archive Wayback Machine, 2013. "Dow Jones Industrial Average®." S&P Dow Jones Indices, a Division of S&P Global, 2018. "Dow Jones Utilities Average Companies." Dogs of the Dow, 2018. Dye, Jessica. "General Electric to be Replaced by Walgreens on the Dow Jones Industrial Average." Financial Times, June 19, 2018. Egan, Matt. "General Electric Gets Booted from the Dow." CNN Money, June 19, 2018. Horn, Elaine J. "What is the Dow Jones Industrial Average?" Business News Daily, October 30, 2012. Peters, Bill. "What is the Dow Jones Industrial Average and What Does it Measure?" Investor's Business Daily, June 20, 2018. Weise, Elizabeth, and Jefferson Graham. "Amazon Agrees to Buy Ring, Maker of Video Doorbells." USA Today, February 27, 2018.